The annual Ramadan observance has begun, and Muslims around the globe are fasting during daylight hours. At the same time, our church is participating in the “30 Days of Prayer” worldwide movement that prays “with faith, hope and love for the Muslim world” during this period. According to the “30 Days of Prayer” booklet, Ramadan is a time when Muslims put a renewed emphasis on prayer, charity and reflection. It is a time when their hearts are open. Here in Australia we see modest signs of this awakening, with a small but steady stream of Iranian Muslims turning up in church and expressing a desire to learn about the Christian faith. At a church where I previously worshipped there were even Farsi-language Bibles available for newcomers, and when we went on a church camp all the lecture slides were in both English and Farsi. Over breakfast at the camp one morning I tried to engage in conversation with some of the Iranians in attendance – mainly young men – asking them questions about their lives. But I found them strangely reticent to talk with me. Still, as I have prayed for – and have come to know – some Iranians in Australia, I have heard a few of their inspiring stories. One told me how he used to secretly watch Christian sermons on the internet back in his home town. “Christianity is a religion of love,” he said. “That really attracted me.” He is still formally Muslim, but often attends church and a Bible study group. Another said she had a job in Iran that involved meeting foreign tourists. “I used to ask them questions all the time about Christianity,” she said. A third was a refugee who came in a leaky boat to Australia. She was detained for a time on Christmas Island, where the Australian government maintains a refugee processing center. She enrolled in art classes, and was so enthusiastic about her new faith that her first major painting was a shimmering image of the cross of Jesus. It was recently displayed in a public exhibition of refugee art. She is donating it to the church that baptised her. This entry was posted in Iran, Prayer on October 21, 2016 by admin. 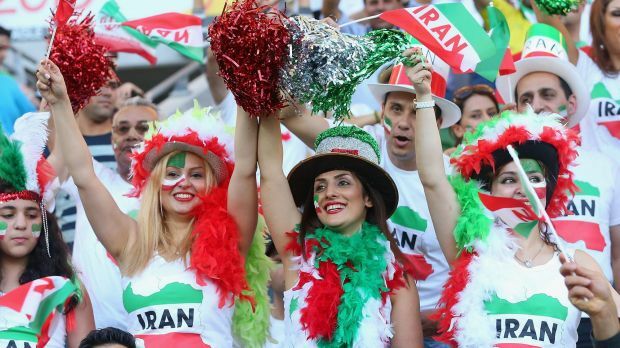 Hundreds of beautiful Iranian women have been turning out to watch their country’s soccer players at the Asian Cup tournament, now under way here in Australia. Ali Akbar Mohamedzade, head of the moral committee of the Iranian Football Federation, issued [a] warning last week as photos of players with women fans circulated on social media. It is an indication that Iran is not as monolithic as many Westerners believe. Despite the fierce anti-Americanism of the government, the people are surprisingly Western in their outlook, and in fact very pro-America. Tens of thousands of Iranians live in Australia. They are showing their support for their former homeland with their enthusiastic support for the Iran soccer team (one of the favorities for the tournament, by the way). But they are also showing that Iran could one day change in ways that no one expects. This entry was posted in Iran, Soccer on January 20, 2015 by admin. * Natan became a Christian because he read a New Testament given to him by a young woman who lived next door. I asked if he had discussed it with her. He pointed out he couldn’t – as a bachelor, it would have been improper for him to have long conversations with her. One day in 2011, Farhad [Natan’s brother] and Natan went by motorbike to give out New Testaments in a village. A police car gave chase, the officers drawing a gun at one point. Trying to escape on their motorbike, they crashed and were injured. They were taken into police custody, and had no medical treatment at all for a week. They were in prison for six weeks, part in solitary confinement, then released on bail. Natan decided to flee the country. * Matthew was arrested for his faith, along with his wife, and imprisoned for three months, including a month in solitary confinement. He was in a cell with ten others, including a journalist, an academic and other professionals, who shared a shower and toilet between them. On release, he fled to Turkey. His mother in law, who put up her house deeds as bail for him, was going to have to return to the police station shortly and was expected to have to forfeit her home. * In Istanbul, Timms heard from an Iranian Christian of a small village where all the residents had become Christians – probably through watching a satellite TV broadcast. [This Iranian Christian] met a nomadic family of seven people there who told him that, not long previously, as they did every year, they arrived at the village to rent a field and farm their animals for a season. They soon noticed something had changed. For a start, they were charged much less rent than usual, and for the first time they were given access to the landowner’s well. They found out these changes were because the landowner had become a Christian. The upshot was this family came to faith too. Only one of the seven, a young girl, can read. So, every night, when they strike camp, she reads the Bible to them and the family prays together. It is stories such as these, from a possibly unexpected source – Stephen Timms is also Chair of the Christian Socialist Movement – that should spur all Christians in the West too, to do all we can to retell these moving and heroic testimonies. This entry was posted in Iran on January 24, 2013 by admin.